Discussion in 'Hunting Info by Country' started by AfricaHunting.com, Feb 1, 2008. If you notice that anything in this article needs to be updated or anything is incorrect or incomplete please help us keep it current by letting us know. Botswana is located in Southern Africa. A landlocked country, Botswana borders Namibia to the West, Zambia to the North, Zimbabwe to the Northeast and South African Republic to the South. This former British protectorate gained its independence in 1966. It was not until 1962 that sport hunting started to catch on in Botswana once hunting outfitters from East Africa established themselves for hunting in Botswana. These well connected hunting outfitters from East Africa partnered with local hunting outfitters in Botswana and in only a few short years, it became one of the finest hunting destinations in Africa. There are two major hunting areas in Botswana, the Okavango Delta and the central region of Kalahari (the Central Kalahari Game Reserve). The Okavango Delta is the largest inland delta in the world. It is undeniably a paradise on earth. The unique habitat is so rich in vegetation and water, it is home to a very diverse animal population. Thousands of Elephants, considerable herds of Cape Buffalo (Syncerus Caffer Caffer), Crocodiles, Hippos, Lions and Leopards are all found in this region. The Okavango Delta is also home to the unique Red Lechwe (Kobus Leche Leche) and an incredible variety of birds. The central region of the Kalahari (Central Kalahari Game Reserve) allows the hunting of some of the largest and most beautiful antelopes in Africa such as the Gemsbok (Oryx Gazella), Cape Eland (Taurotragus Oryx) and Greater Kudu (Tragelaphus Strepsiceros). There are also Lions and Leopards which are hunted with dogs and Bushmen trackers. Elephants are also present in large numbers and can be hunted. Unfortunately, many species have been closed to hunting in Botswana for many years and it seems unlikely that licenses for these species will be granted in the future. These would include the Situtunga (Tragelaphus Spekei), the Sable (Hippotragus Niger), the Roan Antelope (Hippotragus Equinus) and the Southern Reedbuck (Redunca Arundinum). The Common Waterbuck (Kobus Ellipsiprymnus) is also fully protected. Botswana also offers the opportunity to hunt on game ranches. These are fenced territories such as those found in South Africa or Namibia. Several species can only be hunted on these game ranches, Bushbuck (Tragelaphus Scriptus), Black Wildebeest (Connochaetes Gnou) and Blesbok (Damaliscus Dorcas Phillipsii). In the Okavango Delta, as in the Kalahari Game Reserve, hunting areas are open territories, not fenced. The habitat of the Okavango Delta is alternating wet and dry areas with seasonal variation: lagoons, islands, marshes, palms forest and grassy plains. The habitat of the other hunting areas varies little from one region to another. It is primarily sandy terrain including acacia or mopane forests, thorn bush and dry grassy plains. Hunting safaris in Botswana usually begin with a drive in a 4x4 from camp, then once in the bush, tracking on foot. The terrain is flat and the hunting is not very physically demanding. While hunting in the Okavango Delta for species such as Cape Buffalo (Syncerus Caffer Caffer) and Red Lechwe (Kobus Leche Leche), wooden dugout canoes may be used to get to areas inaccessible by other means. ; a truly memorable hunting experience. The hunting areas in Botswana are managed by outfitters and professional hunters who are most often locals or from either South Africa or Namibia. The hunting camps are generally large and comfortable tent camps with full amenities. In the vast majority of cases, access to the hunting areas is by small plane from the capital of Botswana, Gaborone. The hunting season in Botswana runs from the beginning of April through the end of September. Most hunting outfitters do bird hunting. Dove, Pigeon and Quail are hunted throughout the year. Duck, Francolin and Guineafowl from April 1st to September 30th and Sandgrouse from October 1st until April. The single most important thing you need to do to ensure that you are booking with a good hunting outfitter is check their references. The outfitter should provide you with more than a few references, especially clients who have hunted with them within the last year and you should call many of them. Click here to check out our Botswana Hunting Reports, a section where you can find or post more detailed Hunting Reports. Or visit our forums where you can interact with other hunters and industry professionals, post questions or read what others are discussing about hunting in Botswana by clicking here. We are all empowered by learning from each other and we encourage you to make educated decisions based upon honest information and real experience. Click here for Botswana hunting areas map, country and satellite imagery maps. The hottest time of year in Botswana is also the wettest. The rainy season occurs in summer between October and April. Dry and cool weather, with cold and often frosty nights, occurs between May and September, when the average daytime temperature is a pleasant 77DF (25DC). The months between April and October are ideal for tourists in terms of weather and game viewing. This is the time when the wildlife is most prolific and easily spotted around the natural waterholes and dams. The climate of Gaborone is semi-arid, meaning it is hot and dry for most of the year. There is little distinction between average summer and winter temperatures, although in winter months it can be chilly at night. Rain is erratic, but falls mostly in summer in heavy localised downpours that are followed quickly by a return of strong sunshine. Summers are extremely hot with high humidity in the mornings. The best time to visit Gaborone is during spring or autumn when the weather is warm and dry. Most of the country has a subtropical climate, with cooler temperatures prevailing in the higher altitudes. Winter days are warm and nights are cool, with heavy frost common in the desert. Temperatures range from average maximums of 33DC (91DF) in January and 22DC (72DF) in July to average minimums of 18DC (64DF) in January and 5DC (41DF) in July. In August begin the seasonal winds that blow from the west and carry sand and dust across the country. Rainfall normally averages 45 cm (18 in) but ranges from 69 cm (27 in) in the north to less than 25 cm (10 in) in the Kalahari; drought conditions prevailed in the early and mid-1980s. Weather Underground provides a very detailed look at current weather conditions, weather forecasts, a history and almanac for predicting average weather conditions during the time while you will be traveling in that part of the world. Click here for Botswana's climate and temperature forecast. - Hunting Season - 1st Tuesday of April to 3rd Tuesday of September for concession and Community-Based, Natural Resource Management (CBNRM) areas hunt and January 1st to December 31st (all year round) for game ranch areas hunt. - There is no regulation controlling the number of days of a hunting safaris, if a minimum, it is set it is by the safari operator. - A hunter must be a client of a registered Botswana safari company. - Trophy hunting in Botswana is dictated by fair chase regulations and hunting is governed by the Department of Wildlife & National Parks (DWNP) which falls under the Ministry of Wildlife, Environment & Tourism. - Hunting of female, young and/or immature animals is prohibited. - Hunting from a vehicle is not permitted, though the vehicle can be used to reach the area from where hunting on foot can begin. - Shooting an animal from a vehicle is not permitted, a person actually needs to be 220 yards (200 meters) away from a vehicle to shoot an animal. You will find information about the bird hunting season in Botswana near the bottom of this page. Botswana offers a good selection of species for trophy hunting, including Elephant, Buffalo, Leopard and a multitude of plains game species. At this time Lion hunting in Botswana is suspended until further notice from the Department of Wildlife & National Parks (DWNP) that has placed a moratorium on Lion hunting. Click here to visit AfricaHunting.com complete list of species available to hunt in Botswana. Click here to visit our shot placement guide, the most comprehensive shot placement guide of African game online. Bowhunting in Botswana was legalized in 1995 for plains game hunting. Bowhunting big five and/or dangerous game, such as hunting Elephant, hunting Rhino, hunting Cape Buffalo, hunting Lion and hunting Leopard is illegal in Botswana. This country offers tremendous opportunities for bowhunters however few operators have the experience to conduct bowhunting safaris, so careful selection of the hunting outfitter is very important. Game ranches in the eastern part of Botswana are a prime destination for plains game bowhunting as a variety of African trophy hunting species may be found there. It is legal for hunters to import bows for bowhunting purposes into Botswana and no import permit is required. Botswana does not have any minimum equipment requirements for bowhunting so common sense will apply or here below find the requirements for South Africa. - The minimum equipment requirement for rifle hunting in Botswana is .222 caliber for any game other than dangerous game. - The minimum equipment requirement for rifle hunting in Botswana is .375 caliber for dangerous game or big game hunting. - The maximum equipment allowed for rifle hunting in Botswana is .577 Nitro Express caliber. - Botswana does not require a minimum energy (Eo - muzzle velocity) for calibers used. Traveling to Africa usually requires taking at least a couple of different airlines as well as departing from several countries whose laws and regulations are constantly changing. And they all have their own rules, regulations and laws for which it is your responsibility to be aware and in compliance with all of them. For this reason you should read the Africa Hunting article on Laws & Regulations for Hunters Traveling with Weapons by clicking here. The following section contains the basic information you will need to know, for more detailed information you should read Africa Hunting article on Importation or Transiting Procedures Through Countries with Weapons by clicking here, especially if you are transiting through or traveling to another country. - Temporary importation of firearms and ammunition into Botswana is NOT free of charge, please check with your outfitter or the as to the current charges, as they are based upon number of rifles, days of hunt and type of hunting safari. The process is usually quick and easy. - Your hunting outfitter will send you a form to fill out and return to them so they can arrange for your firearms and ammunition temporary import/export permits months prior to your arrival as required by the government of Botswana. This permit will be based upon the firearm information you provide to your outfitter so it is very important that you carefully consider which firearms you will be bringing with you, as once you have submitted the form you will not be able to change your mind. It is very important that all weapons serial numbers be exactly the same when you arrive as what was issued on your import/export permit. Last minute changes of mind cause more problems regarding gun permits than any other reason. Exact number of ammunition is also important. - There is a limit of three firearm per hunter that may be imported into Botswana for trophy hunting purposes. However if traveling through South Africa a maximum of two firearms are allowed even if you are just in transit. Some European countries also have greater limitation than Botswana as to the number of firearms which can be brought into their country even while in transit. You should read the Africa Hunting article on Importation or Transiting Procedures Through Countries with Weapons by clicking here. - A maximum of one hundred (100) rounds of ammunition may be imported per firearm, however you may encounter greater restrictions from the airline(s) you are traveling on or country you are departing from or other countries you may be visiting or transiting through. For more information on this topic, read the Africa Hunting article, Laws & Regulations for Hunters Traveling with Weapons by clicking here. Importation of ammunition into Botswana is subject to a 10% Government Value Added Tax (VAT) so make sure to bring only what is necessary for your hunting safari. - Only ammunition for the specific caliber(s) you are bringing may be imported. - No automatic, semi-automatic firearms are allowed. - No weapons which fall under military categories such as .308 Winchester (7.62x51mm NATO), please check with your outfitter if you have a questionable caliber. - Handguns have been allowed in recent years for hunting purposes. A special permit which the safari operator must apply for prior to the start of the hunt can be requested with the Central Arms registry. This special handgun permit comes at a cost. Need help traveling to or through South Africa with your guns? South Africa is the number one hunting destination in Africa and most safari hunters will at least transit through South Africa even if they are not staying in the country to hunt. That's why the services of riflepermits.com are so valuable. They can help you navigate the stressful and cumbersome process of transiting or importing your guns into South Africa making it easy and less time consuming. riflepermits.com work hand in hand-in-hand with the South African Police Services (SAPS) to provide import/export or in-transit permits for your firearms before you even arrive in South Africa. They will hand deliver your pre-authorized permit to you on arrival and also guide you through the procedure at the SAPS Permit Office making it as hassle free as possible. They also have rifle storage facilities for those who just want to do a bit of traveling or sight seeing in South Africa as well. They can help make your hunting safari a great experience from start to finish! For more information visit their website! There is no Professional Hunters Association in Botswana. The wildlife authorities and the government of Botswana allocates quotas by species to each concession and Community-Based, Natural Resource Management (CBNRM) areas on an individual basis. Trophy hunting in Botswana is governed by the Department of Wildlife & National Parks (DWNP) which falls under the Ministry of Wildlife, Environment & Tourism. Your hunting license and permit will be applied for and obtained by your hunting outfitter well prior to your arrival, please check with your outfitter as to the current charges or if the cost of this paperwork is already included in the price of your hunt. - The hunting outfitter may impose their own guidelines as to the minimum number of days required to hunt certain species or combination of species. - A hunting license is issued for a specific number of species in specific hunting areas and a hunting client may apply for as many hunting licenses as the outfitter may offer. - Clients are only permitted to hunt animals for which a permit is issued. - All animals are subject to quota availability. - Permits must be issued prior to the hunt commencing. - A separate permit must be issued for each individual hunting client. - Booking Fees for Community-Based, Natural Resource Management (CBNRM) areas hunt are charged on a weekly basis. - Clients are expected to abide by all Wildlife Hunting Regulations in Botswana. The importation of some individual sport hunted trophies requires a CITES permit (i.e. African Elephant, White Rhinoceros and Leopard to name a few), you will need to submit an application to the U.S. Fish & Wildlife Service if you are planning to import any of the species on their list. You can download the CITIES permit application forms by clicking here. CITES stands for Convention on International Trade in Endangered Species of Wild Fauna and Flora, visit their web site at www.cites.org. I highly recommend that when it come to the intricacies of importing your hunting trophies do yourself a favor and hire experts to facilitate the process. Tom Kelly from TROPHY SHIPPERS (www.trophyshippers.com) offers an incredible service at a great price. TROPHY SHIPPERS is a family owned company and have been in business since 1981. 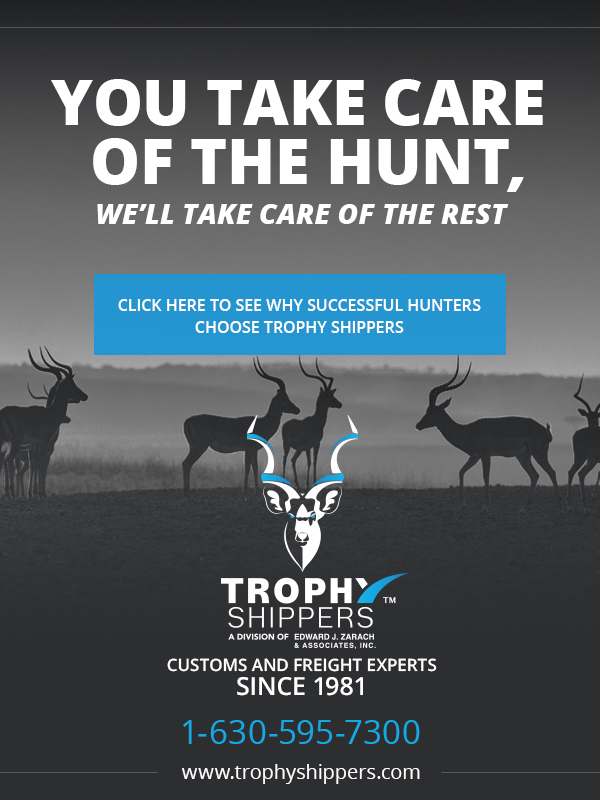 They are a customs brokerage and freight forwarding company that is dedicated to helping hunters quickly and efficiently get their hunting trophies home. They know what your hunting trophies mean to you, because they are a family of hunters themselves. If you have trophies that you need brought back to the United States or are planning a trip to Africa to hunt or anywhere in the world, let TROPHY SHIPPERS handle all of the paperwork, clearances, and shipments for you! They truly provide an invaluable full service for managing an increasingly more detailed and complex process for the importation of your trophies from start to finish. If you would like to contact them, TROPHY SHIPPERS can be reached at Cell +1 (815) 529-0087 / Office +1 (630) 595-7300, or via their website www.trophyshippers.com, click here. - Why You Should Always Use A Hunting Travel Agent! - Why You Should Use A Hunting Trophy Shipping & Importation Specialist! Camouflage clothing is illegal in Botswana and may not be worn for any reason. A majority of international hunting clients will fly directly from their country of origin into South Africa on a major international airline, many of which offer a route to Johannesburg (Tambo International Airport - JNB). This route then require a short flight to get to Botswana's capital Gaborone. You may wish to consider using a travel agent that specializes in hunting worldwide or in Africa as they may be familiar with these routes and used to working with these airlines. Specialty travel agents can often get better deals than you can find on major websites or through regular travel agents. I highly recommend Travel Express, hunting travel specialists, they are the company that I personally use. Lori Spears can help you, she is very knowledgeable and a hunter herself. She can assist you with all aspects of your hunting travel planning from airfare, lodging and car rentals to entry visa's, firearm permits, etc... Click here to visit Travel Express website www.travelexpressagency.com. All foreigners must be in possession of a passport that will remain valid for at least six months after the intended date of departure from Botswana as well as a round trip airline ticket. To find out if you need to apply for a Visa in advance, a great resource with free information is Travel Document System (TDS) at www.traveldocs.com. If you are in need of a visa, Travel Document System is nationally recognized as a leading authority in the field of international Travel Documents. Travelers are quite often not sure of the specific requirements or documentation required to enter into a foreign country. TDS helps international travelers easily understand what is specifically required of them in order to gain passage into another country and provides visa services for U.S. citizens to most countries for which an entry visa is required www.traveldocs.com. No vaccinations or International Health Certificate are required to enter Botswana, however we suggest that you visit the Center for Disease Control & Prevention (CDC) for their recommendations for travel in Botswana. CDC recommends that you see a health-care provider who specializes in Travel Medicine. Find a travel medicine clinic near you by clicking here. If you have a medical condition, you should also share your travel plans with any doctors you are currently seeing for other medical reasons. Malaria prophylactics medication is highly recommended and should be considered as mandatory, however we suggest that you visit the Center for Disease Control & Prevention (CDC) for their recommendations for travel in Botswana as mosquitoes in this country are resistant to some antimalarial drugs. The CDC is most credible online resource for up to date health information. Click here to visit the section dedicated to Traveler's Health specific to Botswana. Information about vaccinations, diseases, prevention, tips and much more can be found here. Click here to enlarge Botswana malaria map. Click here for Africa malaria maps, distribution model, endemic / epidemic risk areas, duration of malaria transmission season and duration of malaria transmission season. No matter if it's your first your first or fifth time hunting in Africa, unavoidable accidents do happen. Whether a medical or security emergency, an evacuation from a remote part of Botswana could cost well over $100,000. I strongly recommend that anyone traveling to Botswana purchase a membership with Global Rescue, the only crisis response company that provides hunters with medical and security evacuation and consultation services anywhere in the world, even the most remote areas. Their deployable teams of paramedics and special operations veterans, backed by on-staff physicians and the specialists at Johns Hopkins Medicine, will get to you wherever you are, by any means necessary, and evacuate you all the way to your home country hospital of choice. If you would like to purchase a membership or have additional questions, Global Rescue can be reached anytime at +1 (617) 459-4200, or via www.globalrescue.com, click here. What you should know before you go. You may obtain international travel information by country, warnings for travelers about crime and public announcements about travel abroad in addition to so much other valuable information http://travel.state.gov. Click here for a complete searchable database of all embassies and consulates from every country in the world including Botswana. Bird Hunting Season in Botswana Botswana. Bird Hunting Season - January 1st to December 31st (all year round), check with your outfitter as he might only offer bird hunts a certain time of the year. Bird hunting fees vary from hunting outfitter and by species. Click here to visit AfricaHunting.com complete list of bird species available to hunt in Botswana. The Botswana Official Government Tourism web site is a good place to explore what options are available for travel outside of your hunting safari, www.botswana-tourism.gov.bw. Your hunting safari outfitter may also offer short excursions up to extensive touring through their company as well. - Official Currency Botswanan Pula (BWP). Denominations in 100, 50, 20, 10, 5, 2 and 1 Botswanan Pula bank notes. To view images of these banknotes, click here. - Electricity, the Botswanan standard is 220/240 volts, three-pin 15 amp outlets. Most lodges/camps have generator(s) to power the electricity through rechargeable batteries therefore it is recommended to bring a small power inverter that plugs into a cigarette lighter to invert 12V DC Power to 110V AC for recharging in the hunting vehicle. Generator(s) in most camps are only run during the morning and evening hours and sometimes can be run at other times by special request. Be sure to check with your hunting outfitter in Botswana what they are using. Click here for more info. Click here for more information about Botswana from the CIA World Factbook which supplies a multitude of facts about Botswana. These species may be available on the hunting license in the country; however they may not be available on quota anywhere in the country. Also individual hunting outfitters may or may not be given any quota or have any remaining licenses left for some species. Some of these species may not be able to be imported back into your country of residence. You can find information on the importation of sport hunted trophies at the U.S. Fish & Wildlife Service at Permits or the Convention on International Trade in Endangered Species of Wild Fauna and Flora (CITES) at www.cites.org. Located south of the Equator and dissected by the Tropic of Capricorn, Botswana is in both the eastern and southern hemispheres. This landlocked country is positioned in southern Africa, and bordered by the countries of Namibia, Zambia, Zimbabwe and South Africa. Google Earth lets you fly anywhere on earth to view map, satellite and hybrid imagery. You can explore rich geographical content by zooming in and out and moving the image by using the arrow buttons in the upper left corner or by clicking on the image and dragging it in the direction you wish to explore. Click here to explore Botswana. Land divisions 9 districts Central, Ghanzi, Kgalagadi, Kgatleng, Kweneng, Northwest, Northeast, Southeast and Southern. 5 town councils Francistown, Gaborone, Jwaneng, Lobatse and Selebi-Pikwe. Malaria prophylactics medication is recommended for visitors to some parts of Africa, ask your hunting outfitter and we suggest that you visit the Center for Disease Control & Prevention (CDC) for their recommendations for travel to your specific destination as mosquitoes in some African countries are resistant to certain antimalarial drugs. Background: This map is a theoretical model based on available long-term climate data. It has a resolution of about 5x5 km. Although it is reasonably accurate, it is not based on actual malaria data and may not reflect the real malaria status. It shows the theoretical suitability of local climatic, and therefore the potential distribution of stable malaria transmission in the average year. Please note that climatic conditions, and therefore malaria transmission, vary substantially from one year to the next. Malaria control activities can also dramatically alter the malaria transmission situation. Meaning: Where climate is "suitable" (red = 1), malaria is likely endemic (hypo-, meso-, hyper- or holoendemic). "Suitable" areas may have little or no malaria because of malaria control. Where climate is "unsuitable" (white = 0), malaria is likely epidemic or absent. Some "unsuitable" areas may actually have endemic malaria because of the presence of surface water in an area where there is little or no rain. In the marginally suitable areas (0.1 - 0.9) transmission may occur at steady but low levels (eg eastern Africa), or in strongly seasonal cycles with great inter-annual variation (eg western & southern Africa). Background: The malaria distribution model has been re-classified into endemic and epidemic areas. These risk areas have then been used to calculate the number of people living in endemic and epidemic conditions. In Southern Africa (Namibia, Botswana, Zimbabwe and South Africa) "endemic" encompasses regions where the climate is 50-100% suitable, whereas in the rest of Africa "endemic" refers to regions where climate is 20-100% suitable. Different cut-offs were used, because in southern Africa malaria is at the limit of its distribution and has been largely reduced through malaria control. Otherwise, all comments on the malaria distribution model apply to this map also. Meaning: Endemic areas are defined as "areas with significant annual transmission, be it seasonal or perennial". Epidemic areas are defined as "areas prone to distinct inter-annual variation, in some years with no transmission taking place at all". Since this is a theoretical model, areas defined as "endemic" may be "epidemic" in reality, or v.v. Background: These maps are also theoretical models based on available long-term climate data. They have a resolution of about 5x5 km. Although they are reasonably accurate, they are not based on actual malaria data and may not reflect the real malaria status. They are based on the theoretical suitability of local climatic, and therefore the potential duration, onset and end of the malaria transmission season, in the average year. Please note that climatic conditions, and therefore malaria transmission, vary substantially from one year to the next. Malaria control activities can also dramatically alter the malaria transmission situation. More work is ongoing to refine these models. Meaning: In the Months of Risk model, malaria transmission is strongly seasonal to epidemic (yellow = 1-3 months), seasonal and endemic (light green = 4-6 months) or perennial and endemic (dark green = 7-12 months). Some areas shown as "No transmission" (white) may actually have endemic malaria because of the presence of surface water in an area where there is little or no rain. Background: Based on the seasonality model, these maps simply reflect the first and last month of the average transmission season. All comments on the seasonality model apply to these maps too. Meaning: The colors indicate the month in which the transmission season starts and ends, in the average year. In a few areas there are two transmission season, so that there are two start and two end of season maps. Has Botswana closed hunting? Can you do an updated article on which African countries have hunting or not, & maybe degree of difficulty to go hunting in each? Now that I have one trip to SA under my belt & taken several common species, I'd like to plan for other places & species. It would be cool to see a table of countries with hunting allowed, relative cost (if possible), travel difficulty, safety, available species (or #of the grand slam list), the "prize" species for that country, etc.. The SCI record book gives a clue for each species where to go & which has the best quality. Links from this table to your detailed descriptions of each could tie it all up. Public land hunting is closed, but private ranches are still operating. These are the typical hunting countries in Africa. You can add Mauritius. Not a lot of species but some interesting hunting. There was hunting in CAR. War/Conflict halted that. I am moving to Botswana for a couple of years for work. Of course I want to bring my rifle. I have two questions regarding that, first is a 30.06 OK to hunt with? The other question is about laws on how to keep the rifle at home. Is there regulations to have specific gun safes?